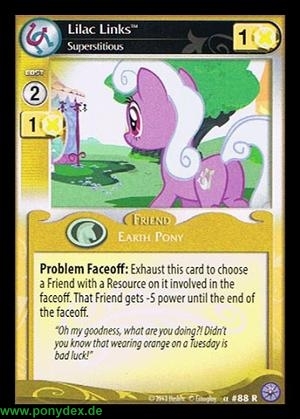 Exhaust this card to choose a Friend with a Resource on it involved in the faceoff. That Friend gets -5 power until the end of the faceoff. "Oh my goodness, what are you doing?! Didn't you know that wearing orange on a Tuesday is bad luck!"